I was driving through North Kilkenny one evening last August. As the road passed through the tree lined green of Freshford I noticed a queue of cars accumulating outside the local GAA pitch of St Lachtains. I was in no particular hurry; in fact I had just been out killing time so I joined the queue. To my delight it turned out that St Lachtains were hosting their near neighbours Tullaroan in a tournament match. The players from both sides were already on the pitch warming up. I wandered down towards the Tullaroan end; I was on the lookout for one man; then there he was. Anyone with even a passing interest in hurling will recognise Tommy Walsh instantly. There the bould Tommy was, dancing on his toes underneath the iconic red helmet. It had been a few years since I saw him last. The last time I had seen him play was up in Croke Park in the colours of Kilkenny as he drove the Cats to yet another All Ireland victory against Tipperary. That was the match that gave us the famous picture of Tommy catching the ball over Noel McGrath’s head; he must have been a good four feet off the ground as he plucked the sliotar from the Dublin sky. As I leant on the railing of the St Lachtains pitch I watched Tommy warm up and wondered if he was still capable of such feats. Tommy was always destined for greatness. 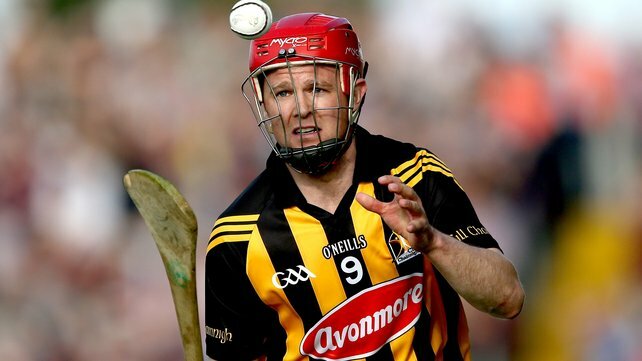 His grandfather Paddy Grace enjoyed a long career with Kilkenny, winning two All Irelands. His father Mikey was a fixture on the Tullaroan team for years. Mikey was full back on the last Tullaroan side to win a senior county final in 1994. If you can dig up a picture of the Tullaroan team photo taken before the game you will see a young Tommy sitting in front of his father. Tommy deserved his place in the photograph. Although only eleven years old he went to as many training sessions that summer as many of the players. Tullaroan people will tell you that from a very young age Tommy was forever down in the hurling field, at first watching his dad train and then as he began to hurl himself underage for Tullaroan. Tommy got used to success from an early age. Tullaroan National School is a small rural primary school. They have spent almost their entire history competing in the second or third level of Kilkenny School’s competition. Tommy arrived as one of the main men within a very talented bunch of youngsters. They won Roinn C, then Roinn B in successive years. When Tommy was in sixth class, in 1995, Tullaroan won the Roinn A title for the first and only time in their history. According to locals they did so at a waltz. They also won the Country Cup and the Lisdowney Seven’s for good measure. Nobody could touch them that year. Among the attendance for the final between Tullaroan and Sarsfields of Cork was Ned Power, the former Waterford goalkeeper and enduring coaching luminary. Power’s attention, as he wrote in his newspaper column the following week, was immediately drawn to the patent mismatch on the edge of the Tullaroan square. The Sarsfields full-forward was a human skyscraper in the form of a teenager. The opposing full-back was an elf who appeared so laughably out of his depth against his gangling marker that Power’s heart went out to him. After 20 minutes Power’s fears had been fulfilled, the twist being it was the unfortunate full-forward who was being eaten alive by the little fella. Power noted the name and filed it away for future reference. Tommy Walsh. Tommy and his young teammates were brought home to a joyously proud village on the back of an open top lorry. Bonfires and celebrations were held in their honour. Tullaroan loves its hurlers. It would not be the last time Tommy experienced such adulation. Tommy went on to hurl underage with distinction for Kilkenny and St Kieran’s. He won a scholarship to UCC and around this time broke on to the Kilkenny senior panel. The rest is history. The young boy in the Tullaroan team photo grew up to become a legend, and here he was, in the twilight of his career warming up not ten feet away from me. As the game opened up you could see that Tommy had lost some of his pace. There was mileage on the clock. But the magic remained. Tommy lined up at half forward that evening against St Lachtains. His brother Pádraig was not playing as he was preparing for an All Ireland final in three weeks. Yet another brother Martin, Tullaroan’s regular centre back was away in Asia on holidays I was informed. The youngest of the Walsh clan, Shane started in the corner. Shane has a big future ahead of him based on what I saw that evening. However it was Tommy that once again stole the show. His legs may have slowed a little, but the wrists and the brain were still fully functional. From half forward Tommy scored six if not seven points from play that evening. He was involved in countless other scores. He drove his young team mates on at every opportunity, cajoling and encouraging. Every 50/50 ball he still won. Every 40/60 ball he still won. In fact he won ball he had no right to win. He can still pluck the ball from the sky as very few hurlers before or since could ever do. I left Pairc Lachtain that evening with my head spinning. Tommy was that good. Christy Ring drew massive crowds to club games in Cork at the end of his playing days, supporters queuing to see a legend in the flesh before it was too late. Ring was before my time but I used to travel to see another all time great, DJ Carey, in action for his club – Young Irelands. DJ was exceptional, the only player I have witnessed bring a senior team to its knees on his own. There are some archaic clips of Christy Ring available online, quite a lot of footage of DJ. Have a look by all means. But it is not the same. You need to see these men for real to really appreciate their greatness. Tommy Walsh is so good that his influence can never be really captured on camera. No microphone could pick up all his directions. To stand ten feet away and see him catch a puck out, turn and pop it over the bar, then immediately shout instructions to his team mates is something everyone should try and experience. Go watch Tullaroan. Go and see this giant of the game before it’s too late. Bring your children. Bring your grandchildren. Fifty years from now they will boast to their friends that they got to see the great Tommy Walsh hurl.